Yes, I know this is the “inferior” translation. But hey, this is all I could get my hands on. But surely, the translation isn’t the bottleneck in understanding what the author is saying, for Bazin himself makes things tough with his analogies and references! Taking examples from almost every field of science and arts – from chemistry to Comédie Française, from geology to Christianity – he stacks one argument upon another, turning down existing critical principles and builds a vision of cinema that does not care as much about the artist’s vision as it does about faithfulness to reality. Presented as an anthology of selected essays from the author’s original four-volume work Que-est-se que le Cinéma? (1958-65), this translation by Hugh Gray has received a lot of flak after the release of the Caboose edition. But the historical importance of this translation remains unquestionable and the book still remains an immensely insightful introduction to the work of arguably the world’s most revered critic. The anthology begins with the small chapter titled “The Ontology of the Photographic Image” where Bazin traces the need for plastic arts, especially cinema way back to the time of the kings. He argues that it is mankind’s ambitious need to preserve the living and hence achieve immortality that has caused the arts to associate themselves to the reality of the world. He pins down the origin of this practice to the Egyptian craft of mummification and then gradually draws out the evolution of the other arts right down to cinema and photography. He illustrates how photography indeed freed painting from its ambivalence by allowing it to retain artistic abstraction and leave faithfulness to reality to photography (“…for photography does not create eternity, as art does, it embalms time, rescuing it simply from its proper corruption.“). This chapter, in fact, becomes the base for all of Bazin’s theory in the rest of the book, establishing his unshakeable faith that the power of cinema lies in its property to reproduce reality without any form of human interference. In the subsequent few chapters, he builds on the first chapter and analyzes what reality and cinema mean to each other. In an interesting section, he puts forth the argument the introduction in sound in cinema was not actually the biggest turning point. He says that the dichotomy that existed was not between the talkies and the silent movies, but between films that relied on reality, like the films of Erich von Stroheim and the ones that were trying to do precisely the opposite, like the Expressionist cinema. He further points out that the introduction of sound was a mere technical triumph that enabled cinema to move one step closer to absolute realism. Carrying the argument forward and considering both extremes – spectacles concocted purely in reality that is faithfully filmed by the camera and spectacles concocted by montage which cuts out facets of reality that may hamper the truth of its world – he examines the advantages and limitations of montage where he exemplifies how montage and its avoidance alter cinematic reality and how montage should be used depending on the context of the sequence filmed. A third of the book is taken up by a chapter titled “Theater and Cinema”, which inquiries in detail what precisely is the difference between the two media is. Strongly supporting Laurence Olivier’s Henry V (1945) and Jean Cocteau’s Les Parents Terribles (1948), Bazin slams the overused critical term “Filmed Theater” and elaborates on the features that separate theater from cinema and why the films that he supports are indeed true to the cinematic medium. He does not agree that it is the mere presence of the actor that makes theater unique, as proposed by earlier theorists. Instead, he postulates that it is the knowledge of being watched – for both the performer and the audience – that forms the basis of classical theater and the one facet that makes it distinct from cinema. A lot of arguments in this chapter went over my head, for Bazin frequently throws in examples from contemporary and ancient French theater to underscore his point. But it is clear that Bazin’s discussion boils down to his theory that that theater space is essentially a showcase of unreality (or a different reality) while that of cinema is true reality. There is a minuscule yet extremely insightful essay on Charlie Chaplin where Bazin deconstruct the tramp and throws light on the social, cultural, comic and cinematic aspects the iconic figure. He stresses that Chaplin would have been a great theatre actor, but his stint in cinema wasn’t, in any way, less brilliant. He illustrates how Chaplin used the medium to not merely photograph a theater act, but to overcome the limitations of theater and derive maximum comic effect out of film editing. That said, one must also acknowledge that the selection of essays from the original French anthology could have been better or at least arranged in a more streamlined fashion. Since Bazin’s canvas of references is huge, spanning several centuries and fields, it is difficult for me to assess the exact outcome of this reading experience. At the end of it, one feels like having read more about other arts than cinema. It is as if Bazin is pruning down all that is not cinema, but usually associated with it, to bring to surface the real meaning and power of the most popular medium – exhausting what is not cinema to derive what is cinema. 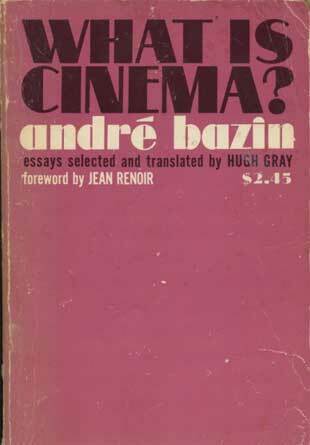 You are right about those allusions Bazin makes in his writings and I doubt film theory and criticism would have morphed into such a healthy vocation – his work especially on neo realism and Bresson is still relevant and enlightening even today. I’ve just begun the second volume and the chunk of the neo-realism essays comes here… Looking forward to it.